The Benin Expedition of 1897 was a punitive expedition by a United Kingdom force of 1,200 under Admiral Sir Harry Rawson in response to the ambush of a previous British-led party under Acting Consul General James Philips (which had left all but two men dead). Rawson's troops captured, burned, and looted Benin City, bringing to an end the west African Kingdom of Benin. As a result, much of the country's stolen art, including the Benin Bronzes, were relocated to Britain. At the end of the 19th century, the Kingdom of Benin had managed to retain its independence and the Oba exercised a monopoly over trade which the British found irksome. The territory was coveted by an influential group of investors for its rich natural resources such as palm-oil, rubber and ivory. After British consul Richard Burton visited Benin in 1862 he wrote of Benin's as a place of "gratuitous barbarity which stinks of death", a narrative which was widely publicized in Britain and increased pressure for the territory's subjugation. In spite of this pressure, the kingdom maintained independence and was not visited by another representative of Britain until 1892 when Henry Gallwey, the British Vice-Consul of Oil Rivers Protectorate (later Niger Coast Protectorate), visited Benin City hoping to open up trade and ultimately annexe Benin Kingdom and make it a British protectorate. Gallwey was able to get Omo n’Oba (Ovonramwen) and his chiefs to sign a treaty which gave Britain legal justification for exerting greater influence over the Empire. While the treaty itself contains text suggesting Ovonramwen actively sought Britain's protection, this appears to be a fiction. Gallway's own account suggests the Oba was hesitant to sign the treaty. Although some suggest that humanitarian motivations were driving Britain's actions, letters written between administrators suggest that economic motivations were predominant. The treaty itself does not explicitly mention anything about Benin's "bloody customs" that Burton had written about, and instead only includes a vague clause about ensuring "the general progress of civilization". It is clear that the Oba did not intend to follow the treaty. While the treaty granted freedom of trade within the Benin Empire, the Oba persisted in requiring customs duties. Since Major (later Sir) Claude Maxwell Macdonald, the Consul General of the Oil River Protectorate authorities considered the 'Treaty' legal and binding, he deemed the King's reaction a violation of the accord and thus a hostile act. In 1894 after the invasion and destruction of Ebrohimi, the trading town of the chief Nana Olomu, the leading Itsekiri trader in the Benin River District by a combined British Royal Navy and Niger Coast Protectorate forces, Benin Kingdom increased her military presence on her southern borders. This vigilance and the Colonial Office's refusal to grant approval for an invasion of Benin City scuttled the expedition the Protectorate had planned for early 1895. Even so, between September 1895 and mid-1896 three attempts were made by the Protectorate to enforce the Gallwey 'Treaty'. Major P. Copland-Crawford, Vice-Consul of the Benin District, made the first attempt, Mr. Locke, the Vice-Consul Assistant, made a second one and the third one was made by Captain Arthur Maling, the Commandant of the Niger Coast Protectorate Force detachment based in Sapele. In March 1896, following price fixing and refusal by Itsekiri middle men to pay the required tributes, the King of Benin ordered a cessation of the supply of oil palm produce to them. The trade embargo brought trade in the Benin River region to a standstill, and the British traders and agents of the British trading firms quickly appealed to the Protectorate's Consul-General to 'open up' Benin territories, and send the King (whom they claimed was an ‘obstruction’) into exile. In October 1896 the Acting Consul-General, James Robert Phillips, visited the Benin River District and had meetings with the agents and traders. In the end the agents and traders were able to convince him that 'there is a future on the Benin River if Benin territories were opened'. In November Phillips made a formal request to his superiors in England for permission to invade Benin City, and, in late December 1896, without waiting for a reply or approval from London, Phillips embarked on a military expedition with two Niger Coast Protectorate Force officers, a medical officer, two trading agents, 250 African soldiers masquerading in part as porters, and in part as a drum and pipe band. To disguise their true intent, the force's weapons were hidden in the baggage carried by the 'porters'. His request to London was to depose the king of Benin City, replace him with a Native Council and pay for the invasion with the 'ivory' he hoped to find in the king's palace. In the meantime he sent a message forward to the Oba, Benin's king, that his present mission was to discuss trade and peace and demanding admission to the territory in defiance of Benin law explicitly forbidding his entry. Unfortunately for Phillips, some Itsekiri trading chiefs sent a message to the Benin king that 'the white man is bringing war'. On receiving the news the Benin king quickly summoned the city's high-ranking nobles for an emergency meeting, and during the discussions the Iyase, the commander in chief of the Benin Army argued that the British were planning a surprise attack and must be defeated. The Benin king however argued that the British should be allowed to enter the city so that it can be ascertained whether or not the visit was a friendly one. The Iyase ignored the king's views, and ordered the formation of a strike force that was commanded by the Ologbosere, a senior army commander, which was sent to Ughoton to destroy the invaders. On 4 January 1897, the Benin strike force composed mainly of border guards and servants of some chiefs caught Phillips' column totally unprepared at Ugbine village near Ughoton. Since Phillips was not expecting any opposition and was unaware that his operation was being perceived with alarm in Benin, the contingent's only weapons, consisting of the officers' pistols, were locked up in the head packs of the African porters. Only two British officers survived the annihilation of Phillips' expedition, which became known as the 'Benin Massacre'. 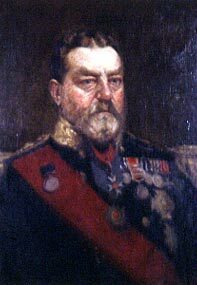 On 12 January 1897, Rear-Admiral Harry Rawson, commanding the squadron at the Cape of Good Hope was appointed by the British Admiralty to lead an expedition to capture the Benin king and destroy Benin City. The operation was named the Benin Punitive Expedition, and on 9 February 1897 the invasion of the Benin kingdom began. The field commanders were instructed by their commander-in–chief to burn down all Benin kingdom's towns and villages, and hang the king of Benin wherever and whenever he was captured. The invasion force of about 1,200 Royal Marines, sailors and Niger Coast Protectorate Forces, and composed of three columns; the 'Sapoba', 'Gwato' and 'Main' Columns. The 'Sapoba' column, and the 'Main column' reached Benin City after 10 days of bitter fighting but the 'Gwato' column was routed at Gwato. Homes, religious buildings and palaces were deliberately torched. On the third day, the blaze grew out of control and engulfed part of the city. The city's walls were once the largest earthworks created in the pre-mechanized era and were estimated to be four times longer in total than the Great Wall of China. Little evidence of these structures still exist after destruction at the hands of the British. Most of the plunder from the city was retained by the expedition with some 2,500 (official figures) religious artefacts, Benin visual history, mnemonics and artworks being sent to England. The British Admiralty confiscated and auctioned off the war booty to defray the costs of the Expedition. The expected revenue from the expedition was discussed already before Phillips set out on his ill-fated journey to the city of Benin in 1896. In a letter to Lord Salisbury, the British Foreign Secretary, Phillips requested approval to invade Benin and depose the Oba, adding the following footnote: "I would add that I have reason to hope that sufficient ivory would be found in the King's house to pay the expenses incurred in removing the King from his stool." About 40% of the art was accessioned to the British Museum in London, some works were given to individual members of the British Military as spoils of war, and the remainder was sold at auction by the British Admiralty to pay for the expedition as early as May 1897 (Stevens Auction Rooms, 38 King Street, London, May 25, 1897, followed by several sales at William Downing Webster, Bicester, between 1898-1900). Most of the Benin bronzes sold at auction were purchased by museums, mainly in Germany. The dispersal of the Benin art to museums around the world catalysed the beginnings of a long and slow European reassessment of the value of West African art. The Benin art was copied and the style integrated into the art of many European artists and thus had a strong influence on the early formation of modernism in Europe. The King of Benin was eventually captured by the British consul-general, Ralph Moor. He was deposed and sent to live out his days in Calabar. He died in 1914. In 2017 a cockerel statue or okukor looted during the 1897 Benin Expedition was removed from the hall of Jesus College, Cambridge, following protests by students against the celebration of colonialism. Jesus College student union passed a motion declaring that the sculpture should be returned. A spokesperson from the university stated that “Jesus College acknowledges the contribution made by students in raising the important but complex question of the rightful location of its Benin bronze, in response to which it has permanently removed the okukor from its hall” and that the university is willing “to discuss and determine the best future for the okukor, including the question of repatriation. ^ a b c "The Annexation of Benin by T.U. Obinyan". Journal of Black Studies. Sage Publications, Inc. 19 (1): 29–40. September 1988. doi:10.1177/002193478801900103. JSTOR 2784423. ^ Igbafe 1970, p. 385. ^ Igbafe 1970, pp. 385-400. ^ a b Igbafe 1970, p. 387. ^ Igbafe 1970, p. 390. ^ a b Koutonin, Mawuna (18 March 2016). "Story of cities #5: Benin City, the mighty medieval capital now lost without trace". Retrieved 20 August 2017. ^ Home, Robert (1982). City of Blood Revisited: A New Look at the Benin Expedition of 1897. London: Lex Collins, 1982. ISBN 0-8476-4824-9. ^ "J.R. Phillips to Foreign Office. Advising the deposition of the Benin King." 17 November 1896. Despatches to Foreign Office from Consul-General Archived 4 September 2006 at the Wayback Machine, Catalogue of the Correspondence and Papers of the Niger Coast Protectorate, 268 3/3/3, p. 240. National Archives of Nigeria Enugu. ^ Akenzua, Edun (2000). "The Case of Benin". Appendices to the Minutes of Evidence, Appendix 21, House of Commons, The United Kingdom Parliament, March 2000. ^ Ben-Amos, Paula Girshick (1999). Art, Innovation, and Politics in Eighteenth-Century Benin. Indiana University Press, 1999. ISBN 0-253-33503-5. ^ "Welcome To News Every Hour: See the Cockerel that is causing serious debate between England and Nigeria (Photo)". Newseveryhour.com. 3 March 2016. Retrieved 17 November 2016. ^ Weale, Sally (8 March 2016). "Benin bronze row: Cambridge college removes cockerel". The Guardian. ISSN 0261-3077. Retrieved 14 October 2017. Igbafe, Philip A. (1970). "The fall of Benin: a reassessment". Journal of African History. 11 (3): 385–400. doi:10.1017/S0021853700010215. JSTOR 180345. European traders in Benin to Major Copland Crawford. Reporting the stoppage of trade by the Benin King 1896 Apr 13, Catalogue of the Correspondence and Papers of the Niger Coast Protectorate, 268 3/3/3, p. 240. National Archives of Nigeria Enugu. J.R. Phillips to Foreign Office. Advising the deposition of the Benin King. 17 Nov 1896. Despatches to Foreign Office from Consul-General, Catalogue of the Correspondence and Papers of the Niger Coast Protectorate, 268 3/3/3, p. 240. National Archives of Nigeria Enugu. Akenzua, Edun (2000). "The Case of Benin". Appendices to the Minutes of Evidence, Appendix 21, House of Commons, The United Kingdom Parliament, March 2000. Ben-Amos, Paula Girshick (1999). Art, Innovation, and Politics in Eighteenth-Century Benin. Indiana University Press, 1999. ISBN 0-253-33503-5. Boisragon, Alan (1897). The Benin Massacre. London: Methuen. Graham, James D. (1965). "The slave trade, depopulation and human sacrifice in Benin history: the general approach". Cahiers d'Études africaines. 5 (18): 317–334. JSTOR 4390897. Bacon, R.H. (1897). Benin, the City of Blood. London: Arnold. Read, Charles Hercules & Dalton, Ormonde Maddock (1899). Antiquities from the city of Benin and from other parts of West Africa in the British Museum. London: British Museum. Gott, Richard (1997). The Looting of Benin. The Independent, 22 Feb.1997. Republished at ARM Press Cutting. (See also related GIF image of the article Battle royal for Benin relics). Retrieved 9 October 2006. Soni, Darshana (1997). The British and the Benin Bronzes. ARM Information Sheet 4, Campaign for the Return of the Benin Bronzes, 1997. Retrieved 9 October 2006. This page was last edited on 12 March 2019, at 22:05 (UTC).